I wanted to climb one of the required winter peaks while there was still some winter left. Although I had now climbed three peaks this winter, none of them were required peaks. So Roy and I set out to go up the easiest of these, Slide. I hoped we could also climb Panther, if we had time. We got to the trailhead after dark, and found we could both comfortably sleep in the back of the car if we faced opposite ways. After a quick breakfast, we were ready to start early (about 7:00 AM). 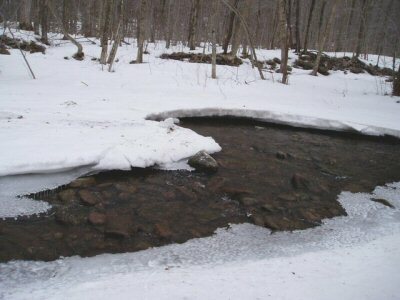 The weather had been warmer during the week, so a lot of water was flowing beneath the snow. The first thing I did was fall into the creek, up to my knees, when the snow that I thought was on the bank turned out to be over the water. It would have been been smarter to turn around and put on dry socks, but I was confident that I would warm up and my feet would not be a problem (which turned out to be true). 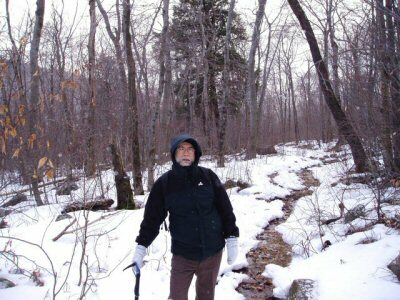 There were a few bare spots on the trail, but mostly it was covered with a foot of snow, gradually increasing to a couple feet of snow up higher. The weather was overcast, so we could not see much besides the trail before us. 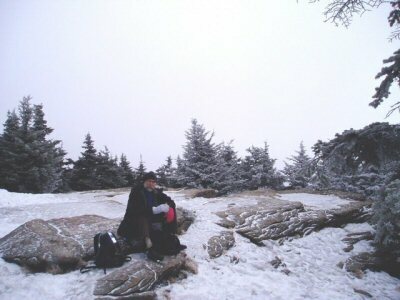 When we got to the summit, all we could see was clouds, maybe a few hundred feet. It took about 2 and ha half hours. After a brief snack, we returned down the trail. On the way down, we saw three parties headed up. It was still early when we got back to the car, so we headed on up the road to the Panther trailhead. This time there was snow only in spots, and a lot more mud than snow. 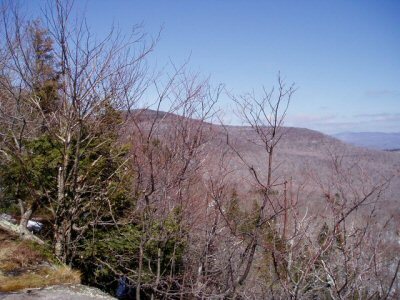 We headed up, quickly reaching the trail junction. Finally, the sky had cleared and the sun was out. 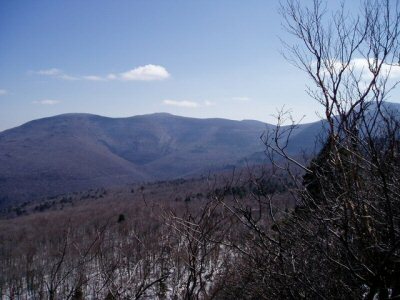 We headed toward Giant Ledge, through a foot or so of snow, past half a dozen parties of hikers. We found a rock with a terrific view, so we stopped and had lunch. We could see for miles and miles. Roy wanted to get back, and Panther was another mile or so farther, so we skipped that, returning the way we had come. 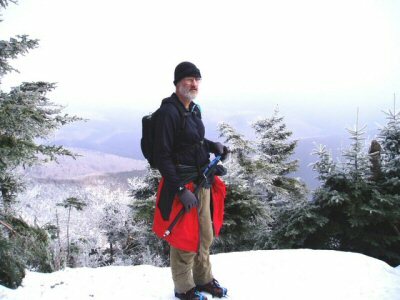 It was a wonderful day to experience the benign joys of winter hiking in pleasant weather.